This sporty jacket will be perfect for a brisk spring or fall day. 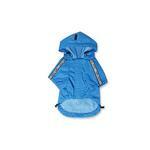 The Sky Blue Base Jumper Raincoat by Puppia is waterproof and designed to reflect current human fashions. 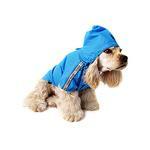 This blue wind breaker dog jacket is lightweight and lined with mesh for ultimate comfort. Base Jumper Raincoat Wind Breaker by Puppia - Sky Blue Customer Photos - Send us your photo! 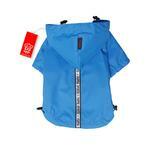 Walker's new rain jacket arrived just in time to keep him dry during the rainstorm from hurricane Arthur. Squirt's new raincoat fits great. The adjustable cinchers on the sleeves and back make it a custom fit. Diesel Dog enduring the rain in style. He loves the reflective strips that keep him safe and his furry mom loves the color and fit! Posted On 03/15/17 by lynne s from East Moriches, NY Yes, lynne s recommends this product! I like this one because going up a size covers more of his body. I have another Puppia raincoat that doesn't cover enough of his back.